"What hurts you, blesses you. Darkness is your candle"
Very often, after the initial experience of awakening and unity consciousness, reaching the highest point of human potential, we fall back into the abyss of ignorance. Ego-consciousness, unable to integrate previous experiences, creates a split between the mind and the heart, which results in a psycho-spiritual crisis. Dramatic changes in perception and lack of intellectual understanding lead to loss of identity. At that point basic instincts for survival in the individual are activated and highly triggered, bringing to the the surface fear and insecurity. The mind becomes overly active, generating a huge amount of fear, stress or anxiety, resulting in emotional instability. The body responds to the state of the mind by creating hormones that put the person in constant fight or flight mode. This strong downward spiral brings the individual to psychosis, mania and the edge of insanity. Losing touch with reality, the individual projects its own issues and states of mind on other people around, in desperate need to be understood, screaming for help and healing. Lack of understanding and spiritual perspective that very often surrounds the individual going through transformative spiritual awakening may result in mental health diagnosis like schizophrenia, borderline personality disorder, bipolar disorder or many others. 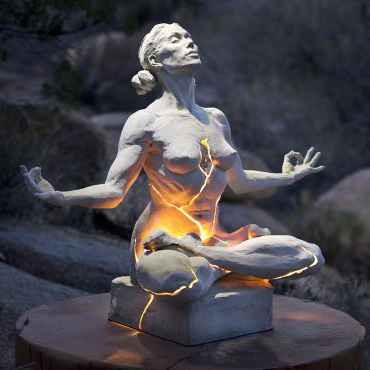 In those moments it is crucial to remember the infinite human potential to heal itself from within. Seeking guidance and relating to others who already walked a similar path is highly recommended. The one who can hold the mirror and in the same time radiate unconditional love and deep compassion can help us tremendously. Individuals who manage to successfully sail through the storm of psycho-spiritual crisis, by creating conscious intention to work on their own shadow side, very often move into another form of spiritual crisis, the Dark Night of the Soul. The Dark Night of the Soul is a period of a deep test of faith. After the realization of God, in the form of our inner state of being, everything that is outside of ourselves loses its sense and meaning. The outer world starts to fall apart and all of the old beliefs and conceptions about who we think we are become irrelevant and false. The individual becomes aware of its own mistakes and imperfections and struggles to forgive and integrate the past. We are called to let go of our attachments, and surrender. Part of ourselves that we so strongly identified with suddenly dies. Deep feelings of loneliness, sadness and grief come from the death of the Ego. This state lasts for many months or years. But finally, the Light from the inside starts shining again on the newborn. Soul takes over, recognizing that the only thing that ever mattered is the way back to the union with God.